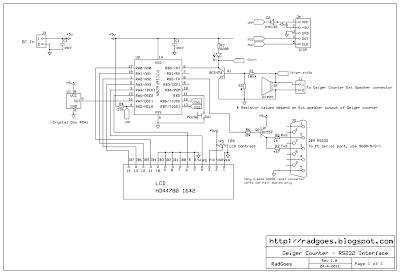 I got request to publish the interface circuit that I'm using to connect my FH40T Geiger Counter to the PC. 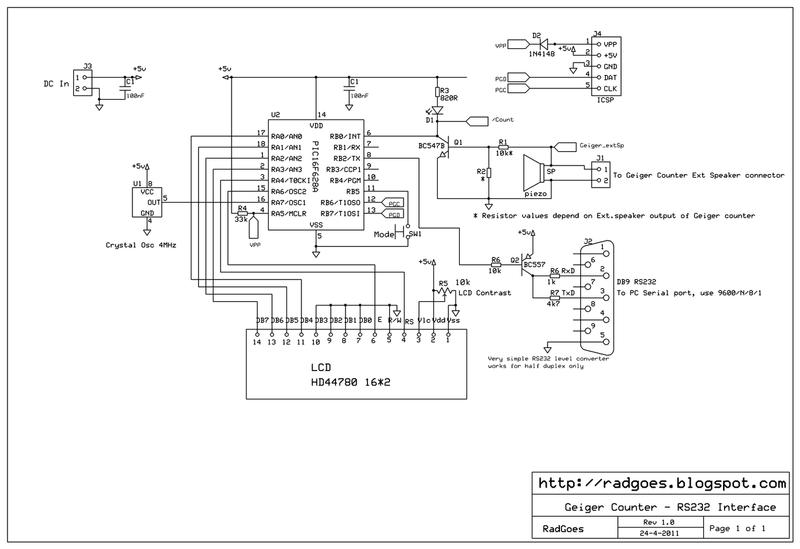 The circuit only existed in my head and on breadboard, so I had to find a software that let me draw the schematic diagram quickly. After some Googling, i decided to try the free software ExpressSCH. I will soon publish the source code for the PIC16F68A, but it should be tidied a bit.first. It uses a modified version of the code published by Emmett Kyle found here. My mod to the software enables outputting measured counter values to the RS232 port for datalogging, and also adjusting timing values to cater for varies Geiger Tube sensitivities. understood from the manual that 320CPM(Imp/min) is equivalent to 0.5mr/hr when FHZ76 is in use. the small r in mr is Rad or Rem most probably and indeed 1r is equivalent to .01 Sv or Gy. Did not find anything about Roentgen units in the manual are you sure? Based on the background radiation in Tokyo my readings are between 5 and 15 cpm according nulleffect spec which is about 78 nSv and 234nSv. Quite realistic until now I think. Fred, thanks for your comment. I was puzzled at first about which units the R means. Until I found some datasheets of the (equivalent) tubes, where the Roentgen unit was mentioned. As i understand it, when measuring Gamma radiation it makes no difference and you can interchange rad rem and Roentgen (except for decimal point position). Yesterday I was able to confirm my readings with the FH40T at a seminar held by Berkeley Nucleonics about their Isotope Spectrometer SAM 940 here in Tokyo. We could use a small Cs-137 standard source to calibrate the SAM-940 but I took the chance to check my FH40T and also compair it with readings from a handheld Inspector (medcom.com). BTW I use GPL Speclab software on a netbook(only Windows or wine4linux) which reads and analyses the sound-clicks and has a Counter/trigger module build-in now. So actually your interface is not needed but anyway thanks for sharing this extra option! Use the the factor 15.625 to convert CPM(Imp/min) to microSievert e.g. 10CPM = 156 nanoSv or 0.156 microSv. I write you in English because we should share this with anybody hoewel ik ook een Nederlander ben. cheers and all the best from Tokyo! Can you share the source code for the pic ?